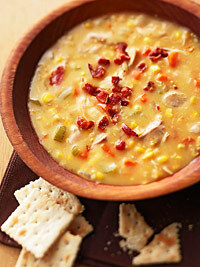 Here is the Cream of Corn Chicken Soup that I promised you. - Frozen or canned corn (or buy a corn cob). I opted for fire roasted frozen corn. I let this cook overnight and when I woke up this morning the aroma was literally dragging me into the kitchen! As the chicken cooks, it releases juice so you don't have to worry about adding in chicken broth. I'm thinking about adding in potatoes or maybe some pasta next time. I went ahead and put a little more soup to the mix because the concoction thickened while cooking.